These little nuggets or bites of deliciousness were the people's choice winner at a recent Crab Cake Cookoff. In other words, I WON, I WON, I WON!!!! !, second year in a row. Enough with the jumping up and down. 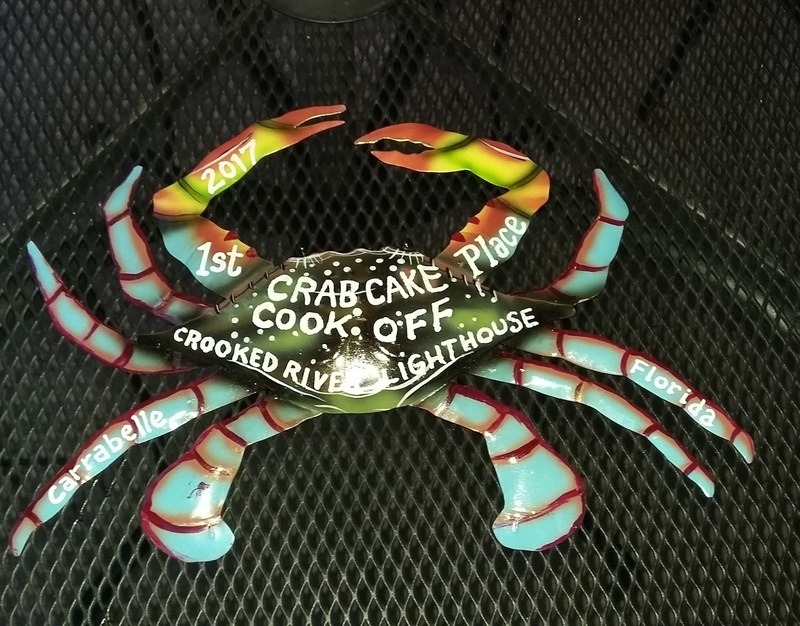 The Crab Cake Cookoff was to benefit our local Lighthouse, the Crooked River Lighthouse to help rebuild the 'Carrabella' Pirate Ship which was torched a couple of years ago. There were 7 fantastic cooks who entered the contest this year, and they were all wonderful. I only got a chance to sample a couple of the other entries, and they were excellent. If you like or even if you don't like crab cakes, you need to try this one out. At first glance it may look like it's got lots of fillers, and lots of veggies, but they just emphasize the sweetness of the crab. I was featured on Miz Helen's Coutry Cottage for Full Plate Thursday. And I got my second coveted Red Plate Award. This crab cake recipe is moist, delicious and easy to make. And not only does it taste great, it's an award winning recipe. Sauté the onions, celery and peppers in the mixed tablespoon of butter combined with the olive oil over medium heat until the onions are just translucent. Remove and let cool. Take the crab out of the container and place into a large bowl. Using your fingers, gently (and I do mean gently), tease the crab apart and test for shells using your fingers. Crush the Oyster/Soup crackers, not too fine, and add to the crab. Toss very gently to combine. They will soften from the liquid from the crab. Beat the egg whites until almost totally stiff. Set aside while you prepare the rest. In a separate bowl, place the mayonnaise, pepper, paprika and egg yolks. Whisk together to combine. Mix in the sautéed peppers, onions and celery. Fold in the beaten egg whites just until combined. Pour this mixture over the crab and crushed crackers. Using your hands or a spatula, toss gently to mix them together. To cook: Form balls the size you want to cook and serve using either a ½ cup scoop or measuring cup. Drop the crab cakes onto a flat plate containing the Panko crumbs and turn gently to coat the crab cakes. Flatten them a little, to form a crab cake. Sauté the Panko coated crab cakes in a mixture of Ghee and Olive Oil until browned, turn over and brown on other side. This takes just a couple of minutes per side. Serve with some of my Danish Remoulade Sauce or your favorite sauce. Note: You can make your own Ghee by heating a stick of butter over low heat until melted. Then using a gravy separator pour off the white milk solids and use the clear fat remaining for frying. You can also separate the milk solids from the fat by pouring them into a Ziploc bag, suspending it from your cupboard with one of the corners pointing down. Let sit for an hour or two and then just snip the corner of the bag, drain the milk solids out and use the remaining butter for frying. I try to keep some Ghee on hand all the time. Congratulations on those award winning Crab Cakes, you are truly the Crab Cake Queen! Hope you have a fantastic weekend and thanks so much for sharing your awesome post with us here at Full Plate Thursday. We hope to see you again real soon. Thanks Miz Helen, they were delicious. Wow. Congrats. I love cook-offs. Especially for worthy causes. It was fun. Hope you stop by and add your favorite recipe from July to First Monday Favorites next week. Congratulations on the win. 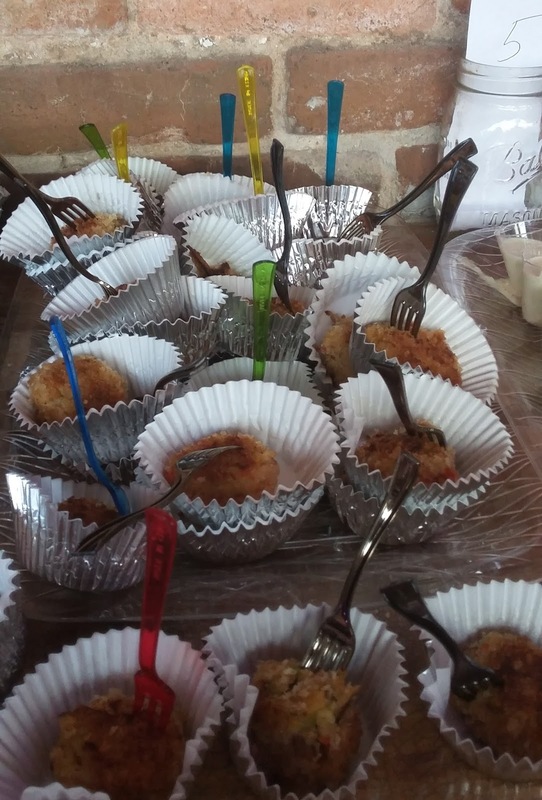 These crabcakes look great. I'm eager to try it out with all the veggies included.